I wish I knew more about geology. It is not a subject suitable for book learnin’. Still, I’m interested. My samples of NYC regional rock include Manhattan schist, purplish diabase from the Palisades Sill, and Staten Island serpentine. But poor Brooklyn, being terminal moraine and outwash plain, is just a jumble of gravel and clays and glacial erratics too large to bring home. You can see some of these in the BBG’s Rock Garden: the rock that came the farthest was pushed about 250 miles from PA. When I was a sprat, we lived north of Naples, Italy. Between us and the city was the town of Pozzuoli, mutilated by the tongues of many of the imperial myrmidions we lived among – Naples being the homeport of the US Sixth Fleet –as “Pots-wally.” I have only vague recollections of a circle in the middle of town, and some ruins, and the knowledge that Sophia Loren grew up there. Years later I was reading Janet Browne’s excellent two-volume biography of Charles Darwin, and I had a strange flashback. Here was Pozzuoli, here were the ruins. They turn out to play an important role in the history of geology, or “undergroundology” as an early proponent called it. Pozzuoli was founded by Greeks. Its pride remains what was once Romantically called the Temple of Serapis, but is now known to be the remains of a covered marketplace. The heart of this is three standing columns of marble. 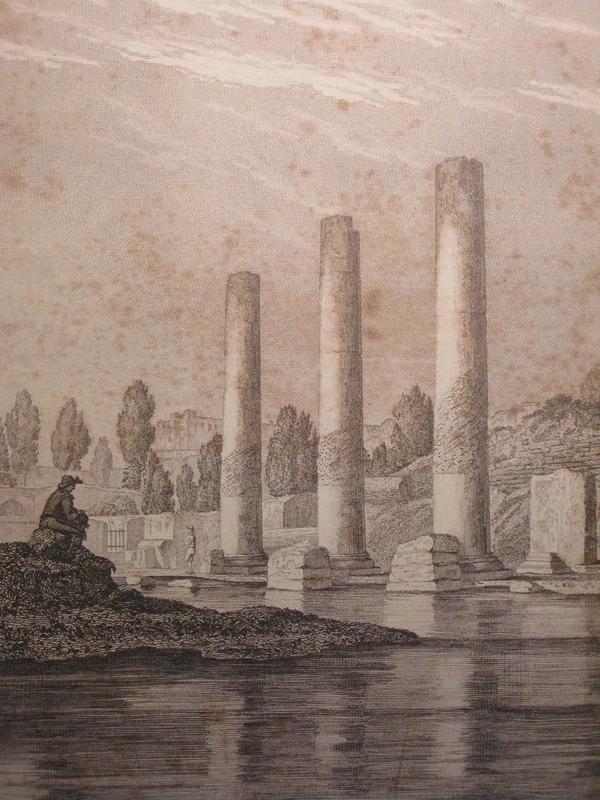 When Charles Lyell (1797-1875) visited he was struck by the damage to the columns. They had been scared and gouged by something, and he recognized the work of marine mollusks, which had dug holes into the marble. But how could this be, since not only were the columns in the dry air now, they had obviously originally been built on dry ground, and the damage began several feet up the column. The context for this is that most Western peoples believed in a tradition of a text few of them could actually read in the original, but which told them that the planet, like the lifeforms on it, was immutable, and, based on some dubious math, just several thousand years old. A “great chain of being” ruled, founded on creation and instructions, and, notably for politics, a hierarchy, from a creator entity. (In this notion, there could be no extinct animals, either; Jefferson believed there had to be living mammoths in the American West and told Lewis and Clark to find them.) Now, plenty of free-thinking and evidence-based types had been questioning this for a long time already, but they had not yet reached the groundswell. But there on the Pozzuoli ground was evidence that the earth was trampoline-like, rising and falling; that sediments could bury the base of the columns, and sea water surround them nearly half way up, allowing “lowly” creatures to burrow into rock (marble was once limestone, itself created by skeletal remains of sea creatures, so calcium carbonate ashes to calcium carbonate ashes, indeed). “Noah’s Flood,” if you insist, was dated to 3290 BC, before the Greeks, so that was no excuse. Pozzuoli is inside a caldera; it’s had a volatile ride over the centuries (my own dearheart has dived off shore to view the ruins of the now-drowned portion.) If this could happen over two thousand years, imagine what might happen over hundreds of millions of them! This was only one piece of the evidence Lyell gathered together for his Principles of Geology, the first volume (1830) of which has a frontispiece an etching of the “present state of the Temple of Serapis at Puzzuoli” reproduced here. Darwin was given a copy of this volume before he boarded the Beagle by his mentor, who urged him to read it but not to believe it. Was there a twinkle in the reverend’s eye when he said this? Darwin would afterwards describe himself as a “zealous disciple” of Lyell, and Alfred Russel Wallace also devoured the book, but Lyell himself at first held firm against the notion of what was then called the “transmutation of species.” Yet he helped set up the undergroundology of it, and at last came to accept it, too — for as the earth moved, so too did life. Great post Matthew. Good of you to mention Alfred Russell Wallace too. Often overlooked in the evolution story. As it happens, he went to Hertford Grammar School, not 10 miles from where I live, so I feel an affinity to him and his understated role. Thanks for the comment, Mark. I’m a big fan of Wallace, who also shows up in my earlier post on amateurism.